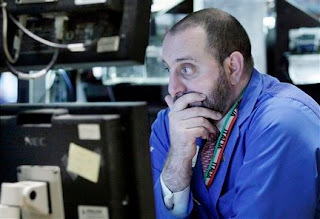 The Dow saw its biggest single day drop on Thursday (down 268 points) since April of 2009, which has cause for concern for many investors, especially heading into Friday's employment numbers. A discouraging employment number would be sure to stick another dagger in the heart of the economy and could very well send us far below 10,000. If there was a good time for the government to smudge the numbers, it would be on tomorrow's employment data. If such things did actually take place, I would not be surprised. Turmoil in Wall Street was do to the great deal of uncertainty taking place overseas in Europe and with the eurozone members. Many countries announced their struggles with cutting deficits as well as selling Treasuries. The Euro took a beating today as investors are wondering if the currency is sustainable. As a result, we saw some strong gains in the dollar, which weathers well for my portfolio. EEV, the emerging markets short ETF, also surged with the news. Gold suffered big losses in markets today, sending GDX down over 5%. GDX puts were on fire today, as investors scrambled to sell their shares. Options should start paying out some very good dividends shortly (if you're on the right side), as the VIX jumped 20% just today! Today felt a lot like early 2009. For many, today's huge losses are a surprise, however, for us that have been tracking the fundamental data, it is no eye opener. The fact is, global economies remain weakened, as consumers struggle to find any extra money to spend these days. Export nations are especially seeing hard days ahead, as countries are doing all that they can to keep production, supplies, and resources domestic. No doubt tomorrow's unemployment will dictate the markets. If hammered by a sore number, we could definitely see another big down day. However, if surprised by a strong number (which I don't see how that could happen), watch out for a strong, aggressive rebound. Either way, my best play is to wait close with my hand on the trigger, waiting for the news. There should still be time to buy into the direction right after the numbers are announced. At this point, all the old inverse ETFS, are coming to the front of my mind. Happy Trading. The dow jones industrials is an outdated index far outdated.